Written for the 50th Anniversary of the Lionel Hampton Jazz Festival (2017), this chart will get your band and your audience up and swingin'! There is plenty of solo space for Tenor Saxophone, Piano and Guitar with fantastic ensemble shouts and look for a surprise at the end! 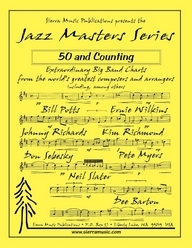 (5-4-4-4) This chart comes right out of the tradition of Sammy Nestico/Count Basie. Originally recorded by the North Texas University 2 O'Clock Band, Vern Sielert's arrangement of "Like Someone In Love" is set in an even-eighths Latin feel. Vern Sielert has created a marvelous arrangement of Michel LeGrand's extremely popular melody. As recorded by the North Texas Two O'Clock Lab Band, it is set in a modern "ECM" swing feel. Vern Sielert has created a marvelous arrangement of Michel LeGrand's extremely popular melody. As recorded by the North Texas Two O'Clock Lab Band, it is set in a modern "ECM" swing feel.